The O’Keefe Rail Trail linked Heathcote to Axedale and Bendigo in mid 2015, then officially opened on 21 Dec 2015. An increasing number of cyclists and walkers were coming to town , seeking food, wine, coffee and often accomodation. 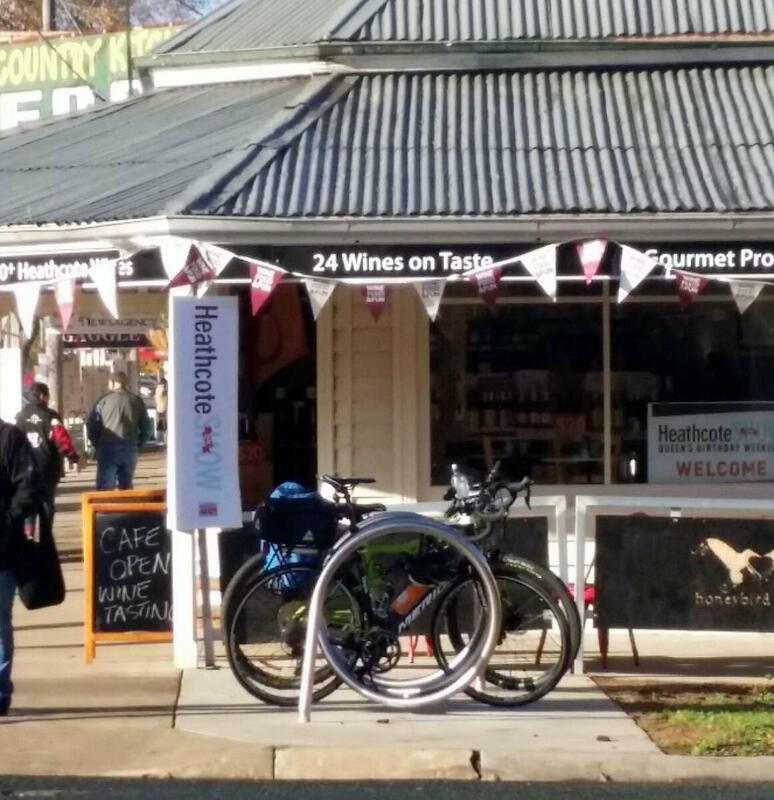 Where were the bikes being left in Heathcote, while all this ‘seeking’ was happening? A review noted bikes leaning against buildings and rubbish bins, or ‘looking lost’ along Heathcote’s High St area. The High St footpaths outside cafes and bakeries were often cluttered by bikes, being dodged by pedestrians. Where were the bike racks to assist? For a town reported as having the longest main street (High St) in Australia, it was found that there were only two (2) aging single hoop bike racks available! With the involvement of some proactive local Heathcote residents plus assistance of the Friends of the Bendigo-Kilmore Rail Trail, the Council and Councillors were approached to review the situation. Realising the lack of bike parking facilities, Council staff then determined the best locations for new racks, with input sort from local businesses. During the investigations, a suggestion was made to Council staff by the Friends of the Bendigo-Kilmore Rail Trail that related to the Heathcote area having the reputation as a producer of fine wines. The suggestion was to provide some ‘corkscrew’ (spiral) bike racks, to align with this wine related reputation. The outcome has become a streetscape highlight, with Council installing three new ‘corkscrew’ or spiral stainless steel racks plus 9 hoop type stainless steel bike racks along High St. The spiral rack types are the first to be installed within the City of Greater Bendigo area, so reflects the impact that the new O’Keefe Rail Trail is having on local cycle tourism! This is a welcome development. I recently, with friends, rode the trail from and to Bendigo spending the night at Heathcote. It was a terrific ride both ways. The obvious bike rider haunts were indeed cluttered with bikes leaning all over the place, so a few more dedicated bike leaning hoops are very welcome by the riders and I am sure by the locals too. Thanks for your feedback and comments, as it sounds like your ride was a great experience. 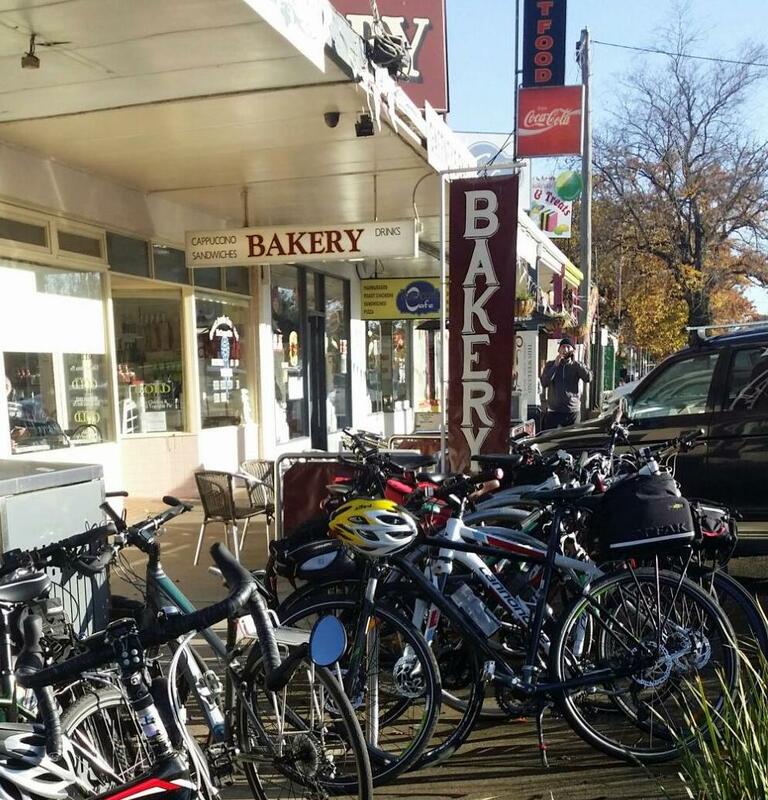 Heathcote and Axedale businesses and local community members are very welcoming of trail riders and walkers, and have assisted in seeking additional facilities like these bike racks. A great outcome for all!